In this update, we are thrilled to be able to present you with our new quest interface! This interface will play an important part in making the game more accessible to new players while, at the same time, saving our veterans a lot of hassle and annoyance. While previous updates have brought numerous improvements to the internal structure of our quest engine and our ability to create new content, these improvements weren’t always directly visible to you, the player. This changes with the new quest interface: picking up quests and advancing them is now a total breeze! In addition, cumbersome manual text triggers and clunky transactions are now a thing of the past thanks to automated quest advancement and item handling. 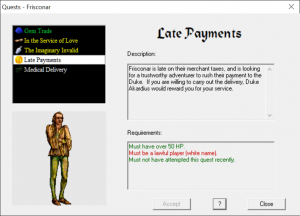 No longer do you have to sift through your inventory to find that one scroll that actually advances the quest or memorize (or more realistically: copy&paste) lengthy texts to deliver the perfect reproach to an unwitting shop keeper! Now you can rebuke an NPC for having “defiled the land with their ways.” at the simple press of a button! “This is all nifty, but how would I, a new and innocent soul in these lands, even know that an NPC needs my help?” you may ask now. (You probably won’t, but just play along here.) Fear not! Desperate NPCs will now let everyone know about their plight by sporting a quest marker above their heads and their quests can now be picked up with a single click of your mouse. The quest interface will also guide you through any additional steps the quest may entail, marking all involved NPCs and monsters for your convenience. Removed the chance for node attacks to sever mana nodes completely. Deactivated nodes will now remain deactivated for a maximum of two hours. PvP is now switched off in a room with a node attack. The number of xeochicatls spawned at a node attack now depends on the number of players online (scaling from 4-10 xeos). Initially either 1 or 2 are spawned, with more added as they are killed or as more players participate. They will also spawn close to the node. The first screens of Sewers of Japser and Barloque now spawn ‘sewer rats’ rather than giant rats. Sewer rats are slightly tougher (45HP) and drop better loot. Adjusted low-level monster spawns in forest areas of the mainland, and increased skeleton spawn rate in Tos Crypt. Slightly lowered the max shillings drop from mollusks (from 1500 to 1300) and thrashers (6000 to 4000), and raised it for shadowbeasts (from 1500 to 2000). Mollusks have gained some all-weapon resist (15%) instead of bludgeon resist (30%). Shadowbeasts have a slightly lowered chance to inflict bleed on the player. Reduced inky-cap mushroom drops from skeletons, mollusks and thrashers. These should still drop more than enough to build up stocks, but the amounts being dropped seemed a bit excessive. Added weapon attributes for Slow, Burn, Fatigue and Bleed. All drop off high level monsters and require 50% in the corresponding weapon skill to use. Distill will now give the caster several chances to say a correct potion name, and will give an error message if the given name doesn’t match a potion type. Guild join timers lowered: joining a new guild after quitting one can be done in 2 hours instead of 4, and rejoining the same guild in 4 hours rather than 72. Disciple robes now start off with the correct master color for their school, rather than the default Kraanan blue. 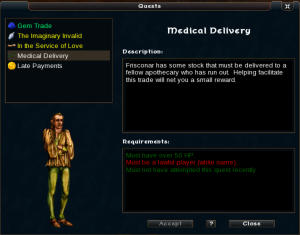 NPC descriptions (right-click on NPC in classic client) now have buttons for ‘Buy’, ‘Offer’ and ‘Quest’, if the NPC has the option available. Widened steps in the forest of Farol mollusk map and adjusted passthrough wall flags to prevent players falling off the stairs so easily. Opened up the Raza gate so it is more clear to players that they leave the city that way, instead of via the old portal (which is no longer used). Add a small roof to Tos Arena, and renovate the Arena entrance to more closely match the new East Ende. Marion Crypt level 1 now has a different floor layout than the Raza Mausoleum. Added a new throne room for the ghost of Far’Nohl, rather than using duplicate rooms for antechamber and throne room. Replaced the ‘object’ pillars in both rooms with pillars that are part of the actual room. 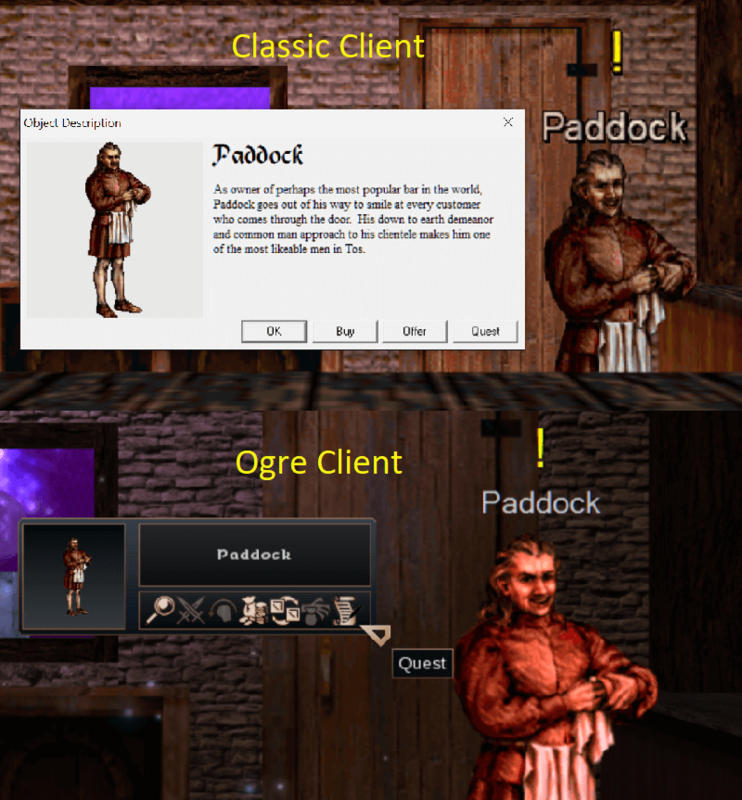 Many rooms have had texture changes, often to improve the appearance in Ogre client. Please let us know if you see any textures that seem out of place. The King’s Way map directly outside Cor Noth has been renamed to Outskirts of Cor Noth to reduce ambiguity (hotfix 2.7.1). Widened ledges in Kardde’s Canyon to make getting to Badlands a little easier (hotfix 2.7.1). Affirmation of the Forsaken (thrasher’s lair) has some gaps widened as they were too close to/below the height of the player (hotfix 2.7.2). Quests can now be obtained and completed using a dedicated quest interface. This interface can be accessed in classic client by right-clicking any NPC that offers quests and clicking the ‘Quest’ button in the description window. 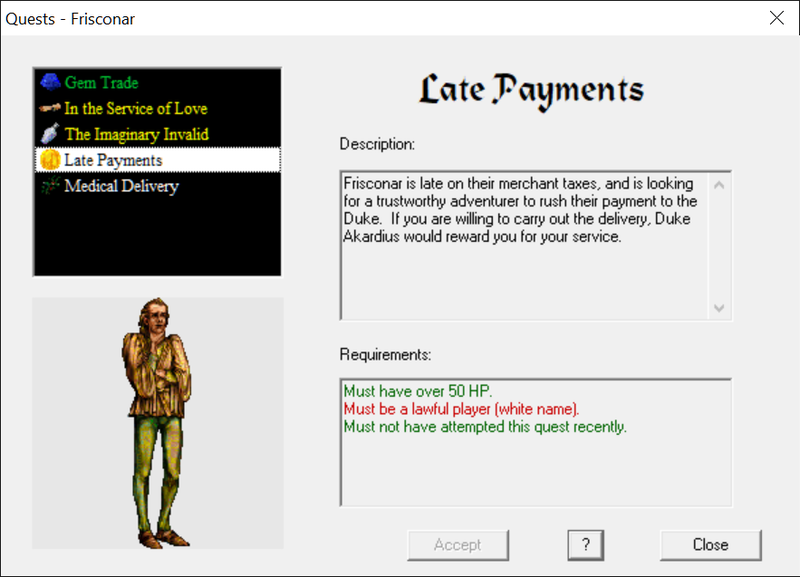 In Ogre, the quest interface is accessed by first targeting an NPC with a left click, then clicking on the quest scroll icon in the target window. 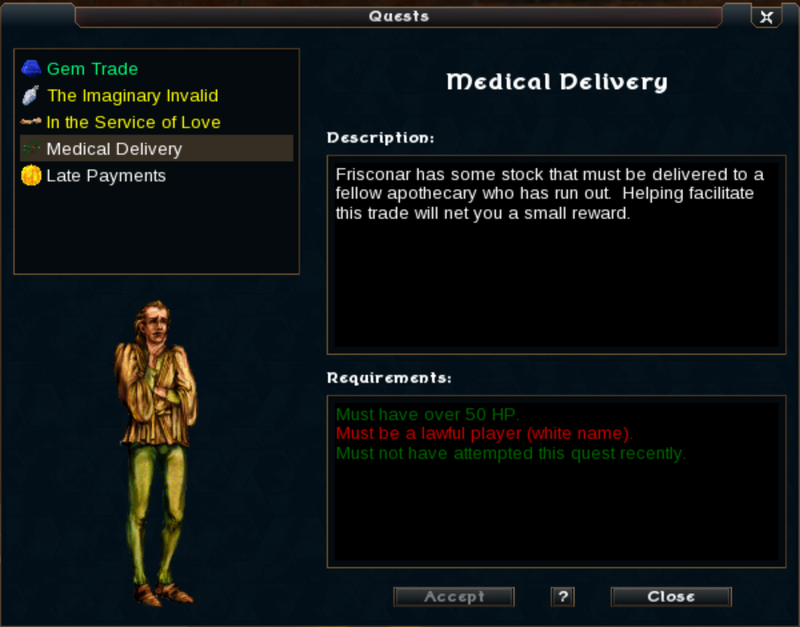 If the player is eligible for any of the quests the NPC offers, a quest marker (“!”) is displayed above their name. There are three types of quest markers: yellow for NPCs that have a new quest for the player, green for NPCs that have a quest the player can continue/complete, and purple on monsters that must be killed for one of the player’s current quests. NPCs or monsters with quest markers also have a similarily colored ring on the minimap. The quest UI has a similar coloring scheme in the quest list – yellow for quests that can be started, green for quests that can be continued/completed, and white for quests that can’t be started yet. Quests that can’t be started will have the unmet requirements shown in red in the ‘Requirements’ dialog box in the NPC’s quest interface. Accepting or continuing/completing a quest via the UI will cause the player to say the appropriate quest text (only visible to that player), or automatically give a required quest item to the NPC. Giving an item to NPC targets the last item in the player’s inventory, and won’t give magic or colored items (hold weapons etc). Added a new quest to the Raza elder, and removed the non-quest speech regarding the mausoleum. Raza NPCs can now participate in other quests (e.g. as the recipient of delivery quests). Giving items to NPCs for quests (manually or using the UI) will no longer trigger a different ‘showup’ type quest. These quests are also no longer triggered just by entering a room. Attempting to trigger a quest manually (e.g. saying ‘disciple’ to a priestess) will no longer trigger an unrelated quest (e.g. priestess chant). The initial quest that leads to the acquisition of a guild shield (“A Job for Professionals”) can now be started by both the guildmaster and his officers (2nd rank). Avar feathers and dress patterns for the insect quest now show up as stars on the minimap. A lot of quests have had their rewards upgraded, mostly shillings (upped 3-10x) and a few have new items available (small amounts of fire/ice/acid arrows from Maleval and Parrin’s quests). Disciple quests (and Parrin’s pupil quest) now reward the player with a robe of the appropriate school. Completing Quintor’s pupil quest will reward the player with an extra-durable scimitar. 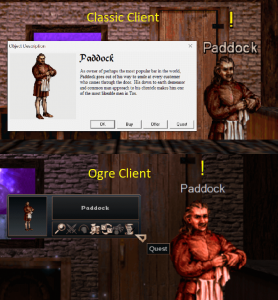 Stopped Ogre client adding an extra “Re: ” on replies to news posts/mails. Ogre client’s guild alliance dropdown box now displays correctly. Fix enchantments cast by a room (e.g. heat) not killing a player correctly if the player hits 0 HP. Fixed players being able to move between bars (e.g. OPB lair) due to an edge case in the new movement code. Also fixed a bug allowing players to move partially into a wall in SW renderer/HW renderer map mode before being bounced back by the server. Fixed players in classic client getting blocked from exiting the alcoves in Jasper adv hall. Prevent the Vigor Boon effect altering the player’s resting vigor permanently. Prevent players casting Apparition on themselves, because they can’t attack the resulting minion. Animate no longer works on dead illusions (reflections, evil twin). Animated minions must come from a real monster. Fixed some bugs in the classic client’s software renderer which were causing crashes. Fix players not being displayed correctly while walking across the bridge at Riija temple. Players who take a penalty from running out of time while phased can no longer be hit by room enchantments (e.g. heat) as they are being teleported. Fixed a bug preventing players who have opted out from PvP from casting helpful spells on non-PvP combatants (hotfix 2.7.2). 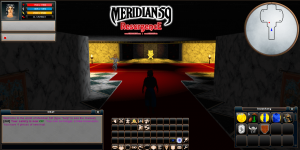 free MMORPG, meridian 59, Meridian 59 Resurgence, Meridian 59 server 105, Meridian 59 update, Update. Bookmark.